LA is in fact 80 small cities joined together and getting from its center in downtown to other districts is often no easy feat, although a number of travel and transport options are readily available in Los Angeles. With a passion for good-looking vehicles and flaunting money, most residents in Los Angeles choose to get around by car, but the traffic can be horrendous in rush hour. Inexperienced drivers shouldn't attempt to navigate LA's complicated freeway system, but if you do have experience in driving in big cities, then travel by car in Los Angeles can be the most time and cost efficient way of seeing things. Other forms of city transport include the Los Angeles bus network and the MetroRail system, while taxis are also available. The largest airport in the world and consisting of nine terminals, Los Angeles International Airport (LAX) handles both international and domestic flights. 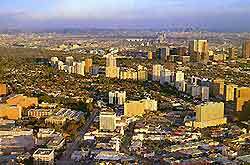 Situated 15 miles / 24 km southwest of the city, Los Angeles Airport has extensive facilities and excellent road, bus, taxi and rail travel links connecting the airport with downtown LA and other areas. There are a number of nearby airport hotels should you have an early departure, while car hire is readily available from all terminals. 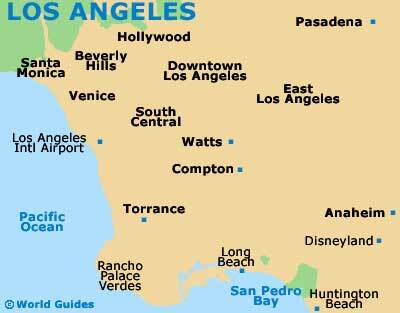 For further information, please refer to the Los Angeles Airport page. Because of the spread out nature of Los Angeles and many of its attractions, travel by hire car can be one of the most convenient ways to get around in LA. Rental cars are cheap here and as long as you can cope with the heavy traffic during rush hour and the complicated freeway system, you will find it by far the easiest way to travel around Los Angeles. Parking is plentiful in Los Angeles and the roads are wide. LA's Metro and Dash bus systems are the ideal way to travel short distances in Los Angeles. However, should you wish to travel between districts in Los Angeles, you may find the systems to be time consuming and limited. Buses should be used for short hops in the daytime only. Exercise caution if you use buses after dark as the city is known for its high crime rate. The city of Los Angeles is connected by the MetroRail system, which operates three frequent and efficient lines. This can be an excellent way to travel around Los Angeles and avoid the traffic, but the small area that the system covers means it is limited in the number of destinations you can reach using the system. For long-distance journeys outside of Los Angeles, Amtrak provides regular services running from Union Station, as well as other stations throughout the city, to San Diego, the Northwest, Midwest and the South. Taxis are readily available in Los Angeles and you can either hail them at the curbside or pre-book via telephone. 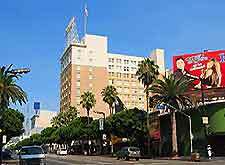 LA's taxi ranks can also be found outside major hotels, theaters and attractions. Taxis are a great way to conveniently cover short distances, but because of the spread out nature of Los Angeles and its traffic congestion, using taxis to travel to LA's many attractions can prove expensive.